What do Escherichia coli (bacterium), Drosophila melanogaster (fruit fly), Caenorhabditis elegans (roundworm), Mus musculus (mouse), and Arabidopsis thaliana (plant) all have in common? Based on the common descent of all living organisms, which share very similar metabolic pathways and common coding of hereditary information in genes using DNA, they have all been widely used as model organisms in general biological research studies. In addition, they have served as specific prototypes for studies on bacteria, insects, invertebrates, vertebrates, and plants, respectively. In 1943, the German botanist Friedrich Laibach proposed Arabidopsis thaliana (thale cress, mouse-ear cress), a small flowering plant of the mustard family native to Europe and Asia—a weed with no commercial value—as a model organism. Decades after completing his doctoral research in 1907 and moving on to other research projects, he returned to Arabidopsis in the 1930s, and devoted the remainder of his career to its study. His research included its mutations and collections of ecotypes—genetically distinct varieties that have adapted their morphology and physiology to their specific and diverse environmental conditions around the world—amounting to 750 Arabidopsis ecotypes in total. Laibach’s research on Arabidopsis was continued in the 1950s by, most notably, the Hungarian-born plant biologist George Rédei, who studied its mutants for decades at the University of Missouri. A number of factors have contributed to Arabidopsis being embraced by biologists as a model organism for studies on plant biology, genetics, and evolution. Its small size has permitted researchers to grow thousands of plants in a very small space. In addition, it has a rapid life cycle, with a seed growing to a mature, easily cultivated plant, producing 5,000 seeds, in only six weeks. As part of his doctoral dissertation in 1907, Laibach correctly determined that the plant had only five pairs of chromosomes—among the smallest number in any plant—which facilitated pinpointing the location of specific genes. In 2000, it was the first plant whose genome had been sequenced, with 27,400 genes identified. Mutations are easily produced, and its plant cells are readily transformed with foreign DNA. SEE ALSO: Origin of Life (c. 4 Billion BCE), Eukaryotes (c. 2 Billion BCE), Land Plants (c. 450 Million BCE), Theories of Germination (1759), Evolutionary Genetics (1937), DNA as Carrier of Genetic Information (1944), Genetically Modified Crops (1982), Human Genome Project (2003). 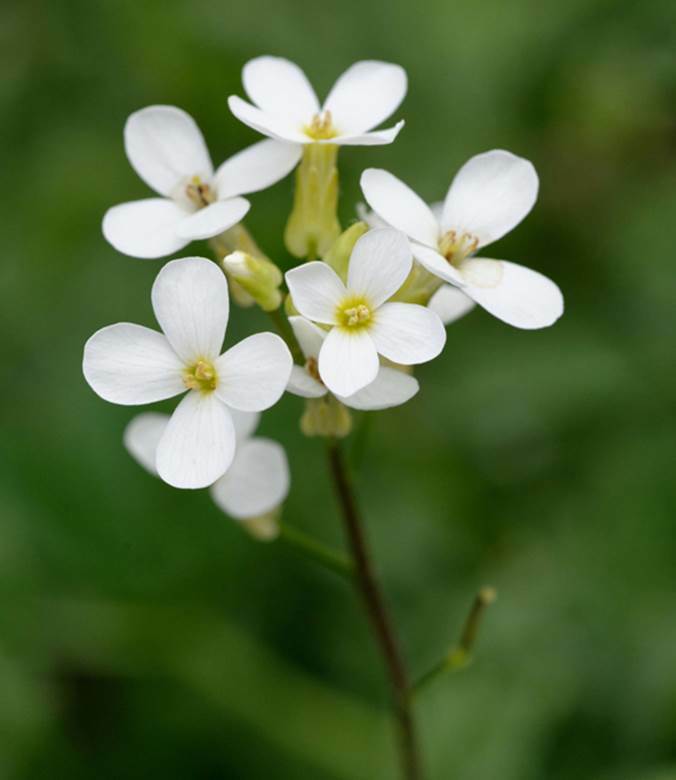 The Arabidopsis thaliana (thale cress), a member of the mustard family, is widely used as a model organism in plant biology for studies in genetics and the molecular biology of flowering plants.